This time Lyndsey, Hayley and I were joined by my Mom and Dad for a Sunday morning brunch. It was terrific as usual and I left with a sweet cafe Americano caffeine high and a belly full of delicious waffles. My Mom and Dad departed for the burbs and the ladies and I set off on a little walk. We headed for Coal Harbour and the Sea Wall and I whipped out the camera. Nothing beats playing tourist in your own city. Harbour Green Park is great and is often over looked for the more trendy spots in English Bay and Kitsilano. The waterfront has grown immensely over the past ten to fifteen years and is truly modern and beautiful. 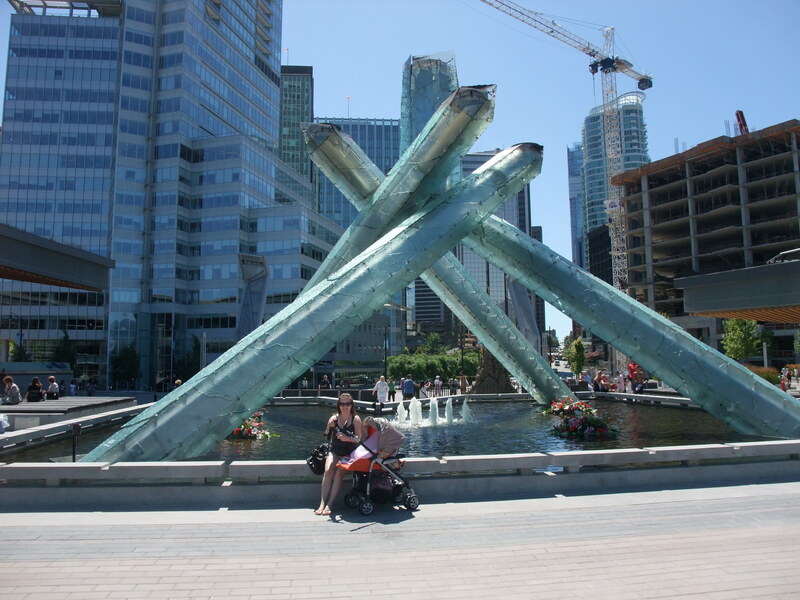 We headed down towards the convention center and over to Canada Place, I took a picture of Lyndsey and Hayley in front of the Olympic Cauldron. Hayley was born 8 days before the 2010 winter games began and Lyndsey didn’t get to see the cauldron when it was lit. It was nice to have all three of us there as a reminder of what we were going though while Vancouver was the center of the worlds attention. We headed for home, which will soon only be a short walk from where we were. I love this city. Thanks for the kind words! You can subscribe via email on the right hand side of my home page. When I stumble upon a really great article I usually do a few things:1.Forward it to the close contacts.2.save it in some of the favorite bookmarking sites.3.Make sure to visit the same site where I came accross the article.After reading this article I’m seriously concidering going ahead and doing all 3!